Obama also would have to alter some longstanding alliances – including those with Turkey, Saudi Arabia and Israel – and correct some of the false narratives that have been established during his administration, such as storylines accusing the Syrian government of using sarin gas on Aug. 21, 2013, and blaming the Russians for everything that’s gone wrong in Ukraine. In retracting false allegations and releasing current U.S. intelligence assessments on those issues, the President would have to repudiate the trendy concept of “strategic communications,” an approach that mixes psychological operations, propaganda and P.R. into a “soft power” concoction to use against countries identified as U.S. foes. “Stratcom” also serves to manage the perceptions of the American people, an assault on the fundamental democratic precept of an informed electorate. Instead of honestly informing the citizenry, the government systematically manipulates us. Obama would have to learn to trust the people with the truth. Whether Obama recognizes how imperative it is that he make these course corrections, whether he has the political courage to take on entrenched foreign-policy lobbies (especially after the bruising battle over the Iran nuclear agreement), and whether he can overcome his own elitism toward the public are the big questions – and there are plenty of reasons to doubt that Obama will do what’s necessary. But his failure to act decisively could have devastating consequences for the United States and the world. In a way, this late-in-his-presidency course correction should be obvious (or at least it would be if there weren’t so many layers of “strategic communications” to peel away). It would include embracing Russia’s willingness to help stabilize the political-military situation in Syria, rather than the Obama administration fuming about it and trying to obstruct it. For instance, Obama could join with Russia in stabilizing Syria by making it clear to putative U.S. “allies” in the Mideast that they will face American wrath if they don’t do all that’s possible to cut off the terrorists of the Islamic State and Al Qaeda from money, weapons and recruits. That would mean facing down Turkey over its covert support for the Sunni extremists as well as confronting Saudi Arabia, Qatar and other Persian Gulf sheikdoms over secret funding and arming of these jihadists. If Obama made it clear that the United States would take stern action – such as inflicting severe financial punishments – against any country caught helping these terrorist groups, he could begin shutting down the jihadists’ support pipelines. He could also coordinate with the Russians and Iranians in cracking down on the Islamic State and Al Qaeda strongholds inside Syria. Given the severity of the crisis – as the refugee chaos now spreads into Europe – Obama doesn’t have the luxury anymore of pandering to the neocons and liberal interventionists. Instead of talking tough, he needs to act realistically. In a sense, Russian President Vladimir Putin has clarified the situation for President Obama. With Russia stepping up its military support for Assad’s regime with the goal of defeating the Islamic State’s head-choppers and Al Qaeda’s terrorism plotters, Obama’s options have narrowed. He can either cooperate with the Russians in a joint campaign against the terrorists or he can risk World War III by taking direct action against Russian forces in pursuit of “regime change” in Damascus. Though some of Official Washington’s neocons and liberal war hawks are eager for the latter – insisting that Putin must be taught a lesson about Russia’s subservience to American power – Obama’s sense of caution would be inclined toward the former. The underlying problem, however, is that Official Washington’s foreign policy “elite” has lost any sense of reality. Almost across the board, these “important people” lined up behind President George W. Bush’s invasion and occupation of Iraq, arguably the worst blunder in the history of U.S. foreign policy. But virtually no one was held accountable. Indeed, the neocons and their liberal interventionist sidekicks strengthened their grip on the major think tanks, the op-ed pages and the political parties. Instead of dialing back on the “regime change” model, they dialed up more “regime change” schemes. Although historically the U.S. government – like many other imperial powers – has engaged in coups and other meddling to oust troublesome foreign leaders, the current chapter on “regime change” strategies can be dated back to the late 1970s and early 1980s with what most American pundits rate a success: the destruction of a secular regime in Afghanistan that was allied with the Soviet Union. Starting modestly with President Jimmy Carter’s administration and expanding rapidly under President Ronald Reagan, the CIA mounted its most ambitious “covert” operation ever – funding, recruiting and arming Islamic extremists to wage a brutal, even barbaric, war in Afghanistan. Ultimately, the operation “succeeded” by forcing a humiliating withdrawal of Soviet troops and driving the Moscow-backed leader Najibullah from power, but the cost turned out to be extraordinary, creating conditions that gave rise to both the Taliban and Al Qaeda. In 1996, the Taliban took Kabul, captured Najibullah (whose tortured and castrated body was hung from a light pole), and imposed a fundamentalist form of Islam that denied basic rights to women. The Taliban also gave refuge to Saudi extremist Osama bin Laden and his Al Qaeda band enabling them to plot terror attacks against the West, including the 9/11 assaults on New York and Washington. In response, President George W. Bush ordered an invasion and occupation of Afghanistan in late 2001 followed by another invasion and occupation of Iraq in 2003 (though Iraq had nothing to do with 9/11). Those “regime changes” began a cascade of chaos that reached into the Obama administration and to the present. As Iraq came under the control of its Shiite majority allied with Shiite-ruled Iran, disenfranchised Sunnis organized into increasingly vicious rebel movements, such as “Al Qaeda in Iraq.” To avert a U.S. military defeat, Bush undertook a scheme of buying off Sunni leaders with vast sums of cash to get them to stop killing U.S. soldiers – called the “Sunni Awakening” – while Bush negotiated a complete withdrawal of U.S. troops. The payoffs succeeded in buying Bush a “decent interval” for a U.S. pullout that would not look like an outright American defeat, but the huge payments also created a war chest for some of these Sunni leaders to reorganize militarily after the Shiite-led regime of Prime Minister Nouri al-Maliki refused to make significant economic and political concessions. Obama had opposed the Iraq War, but he made the fateful choice after winning the 2008 election to retain many of Bush’s national security advisers, such as Defense Secretary Robert Gates and General David Petraeus, and to hire hawkish Democrats, such as Secretary of State Hillary Clinton and National Security Council aide Samantha Power. Obama’s pro-war advisers guided him into a pointless “surge” in Afghanistan in 2009 and a “regime change” war in Libya in 2011 as well as a propaganda campaign to justify another “regime change” in Syria, where U.S. Sunni-led regional “allies” – Turkey, Saudi Arabia and Persian Gulf sheikdoms – took the lead in a war to oust President Assad, an Alawite, an offshoot of Shiite Islam. Syria was allied with Iran and Russia. At the same time, the Sunni rebel group, “Al Qaeda in Iraq,” expanded its operations into Syria and rebranded itself the Islamic State before splitting off from Al Qaeda’s central command. Al Qaeda turned to a mix of foreign and Syrian jihadists called Nusra Front, which along with the Islamic State became the most powerful terrorist organization fighting to oust Assad. When Assad’s military struck back against the rebels, the West – especially its mainstream media and “humanitarian war” advocates – took the side of the rebels who were deemed “moderates” although Islamic extremists dominated almost from the start. That clamor rose to a fever pitch in late August 2013 after a mysterious sarin gas attack killed hundreds of Syrian civilians in a Damascus suburb. The State Department, then led by Secretary of State John Kerry, rushed to a judgment blaming the atrocity on Assad’s forces and threatening U.S. military retaliation for crossing Obama’s “red line” against using chemical weapons. But the U.S. intelligence community had doubts about the actual perpetrators with significant evidence pointing to a “false flag” provocation carried out by Islamic extremists. At the last minute, President Obama called off the planned airstrikes and worked out a deal with President Putin to get Assad to surrender Syria’s chemical weapons arsenal even as Assad continued to deny a role in the sarin attack. Still, the U.S. conventional wisdom held fast that Assad had crossed Obama’s “red line” and – amid more bellicose talk in Washington – Obama authorized more schemes for training “moderate” rebels. These sporadic efforts by the CIA to create a “moderate” rebel force failed miserably, with some of the early trainees sharing their weapons and skills with Nusra and the Islamic State, which in 2014 carried its fight back into Iraq, seizing major cities, such as Mosul and Ramadi, and threatening Baghdad. As the Islamic State racked up stunning victories in Iraq and Syria – along with releasing shocking videos showing the decapitation of civilian hostages – the neocons and liberal war hawks put on another push for a U.S. military intervention to achieve “regime change” in Syria. But Obama agreed to only attack Islamic State terrorists and to spend $500 million to train another force of “moderate” Syrian rebels. Like previous efforts, the new training mission proved an embarrassing failure, producing only about 50 fighters who then were quickly killed or captured by Al Qaeda’s Nusra and other jihadist groups, leaving only “four or five” trainees from the program, according to Gen. Lloyd J. Austin III, head of the U.S. Central Command which has responsibility for the Middle East. The failure of the training program – combined with the destabilizing flow of Mideast refugees into Europe from Syria, Iraq, Afghanistan, Libya and other countries affected by the regional chaos due to “regime changes” – has brought new calls across Official Washington for, you guessed it, a U.S.-imposed “regime change” in Syria. The argument goes that “Assad must go” before a solution can be found. But the greater likelihood is that if the U.S. and its NATO allies join in destroying Assad’s military, the result would be Sunni jihadist forces filling the vacuum with the black flag of terrorism fluttering over the ancient city of Damascus. That could mean the Islamic State chopping off the heads of Christians, Alawites, Shiites and other “heretics” while Al Qaeda has a new headquarters for plotting terror strikes on the West. Millions of Syrians, now protected by Assad’s government, would join the exodus to Europe. 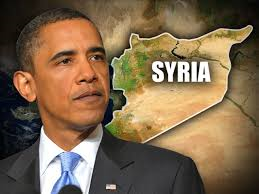 Then, the option for Obama or his successor would be to mount a major invasion and occupation of Syria, a costly and bloody enterprise that would mean the final transformation of the American Republic into an imperial state of permanent war. Instead, Obama now has the option to cooperate with Putin to stabilize the Syrian regime and pressure erstwhile U.S. “allies” to cut off Al Qaeda and the Islamic State from money, guns and recruits. Though that might seem like clearly the best of the bad remaining options, it faces extraordinary obstacles from Official Washington. Already there are howls of protests from the neocons and liberal interventionists who won’t give up their agenda of more “regime change” and their belief that American military power can dictate the outcome of every foreign conflict. So, whether Obama can muster the courage to face down these bellicose voices and start leveling with the American people about the nuanced realities of the world is the big question ahead.